In Alison Evans’ latest novel the zombie apocalypse has hit Australia with force. 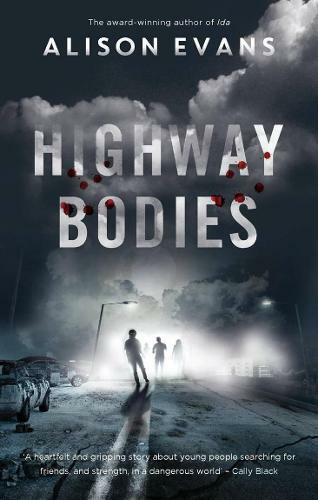 Highway Bodies is written from the perspective of three different teens, all of whom are forced to lean on those close to them in this harsh new reality. Dee and her bandmates escape to a secluded bush cabin on a post-graduation trip. Upon emerging from their isolation, they find no signs of life in the nearby towns. A social media blackout, limited television programming and no phone signal leaves Jojo and their sister Rhea, who are used to being saturated in information, in the dark. And a third, unnamed-until-the-end character, affirms her identity as a trans girl and finds partnership in a time of crisis. The characters’ stories overlap in a gripping narrative. While trying to find answers, and ultimately survive, the teens are made to navigate issues of friendship, gender, and identity. Think Tomorrow When the War Began-style survival camaraderie, but with contemporary teens and lots of zombies. If you enjoyed Evans’ 2017 novel Ida, this will definitely be another hit. Highway Bodies is for fans of LGBTQIA+ fiction, and anyone who loves a good post-apocalyptic adventure. For ages 14+. Kealy Siryj works as a bookseller at Readings Carlton and Readings Kids.